Proper maintenance of sliding bearings and timely maintenance is to ensure the normal operation of road machinery is an important aspect. If the sliding bearing maintenance, maintenance is good, you can work thousands of hours or even longer. On the contrary, will make significant decline in the sliding bearing life, and even appear Burnt, axle and other serious accidents. Usually bearing lubricant temperature not higher than 50 degrees Celsius. In order to ensure adequate lubrication, lubrication, reliable, timely, or regularly check the oil level, the oil level maintained within the specified range. To maintain some clean fuel quality requirements by timely replacement. The sliding bearing failure to specific conditions, and promptly removed. Bearing heating. 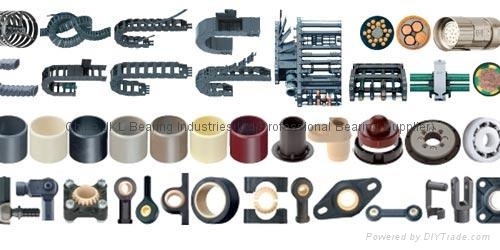 If the bearing oil shortage, should come and check oil is smooth; if there are impurities in oil should be cleaned bearings, replace with new oil, clean the filter; if defective assembly, journal and bearing skew with partial load, in bottom bearing shims: If the bearing clearance is too small, you should re-adjust the gap. Axis heat. If the shaft gear oil or rubber seals tightly, the position should be adjusted to cover the filler; if the shaft and the bearing cap radial friction, check and adjust the shaft and the bearing cap radial clearance. Main friction surface less oil. If the oil temperature is low, poor mobility, shallow oil groove should be cleaned pipeline deepen oil groove; if the oil temperature is low, poor mobility, the ambient temperature should change the oil; if the oil ring is rotated slowly, poor oil spill, the oil should be checked ring is off, grazing, oil level is too high can put oil to the standard height; when adjusting shim block lubricants, should examine and adjust the shim locations. Oil spill. If the amount of oil and more oil supply should be adjusted to maintain the oil standard height; if seal failure, should tighten gland, thick blankets or replace the seal ring material; if bearing holes, oil leakage, replace the bearing seat or fill lead way blocked pores. Axial runout. If the bearing clearance is too large, you should withdraw gaskets, adjust; if the rotating body balancing bad, you should check and adjust the balancing; unstable if the bearings, bearing bolts should be tightened; coupling installation offset is greater if should be ground bearing shims, adjusting coupling mounting accuracy.